From the big guys to the unconventional players on the scene, we delve in to the ATX coworking scene to help you get immersed in to your ideal work environment. With things changing at a dizzying pace these days, flexibility means everything. Enter the coworking revolution. Never has there been more options for the entrepreneur and small business. Plus, the many community-building benefits of coworking spaces keep freelancers engaged. 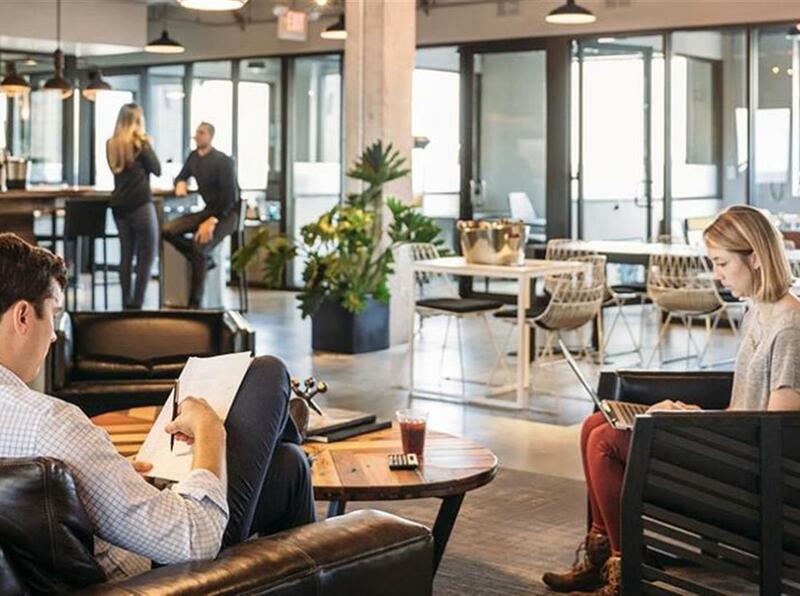 Whether you want the big city grind of WeWork Downtown or a tiny enclave to write your novel, Austin's best coworking spaces are chronicled below. If you know of one that isn't covered in here, please speak up and let us know! I shudder to think what it must have been like for an entrepreneur growing a small business to rent office space in the past. With fickle lease terms and concrete contracts, you'd have to essentially make a choice: lease a large space that's hard to afford and hope you grow in to it, or play it safe by nabbing an affordable space that you'll outgrow if things go according to plan. Either way, renting office space in ATX is an expensive hassle. First of all, what is a coworking space? It's a physical location where professionals from all walks of life gather during the day to focus on their work alongside each other. The benefits are many for the typical freelancer: the isolation of working at home is gone, and so are the distractions of watching just one more episode of Black Mirror. Most coworking spaces charge a monthly fee with differing levels of privacy and space costing more. From independent freelancers to growing small businesses--even to decentralized real estate firms across large cities--coworking spaces have naturally blossomed from the Millennial-driven empowerment of the individual through technology in our hyper-connected world. Let's start with the biggest player of them all: WeWork. This titan of co-working recently dethroned JP Morgan as the #1 tenant of office space in Manhattan. 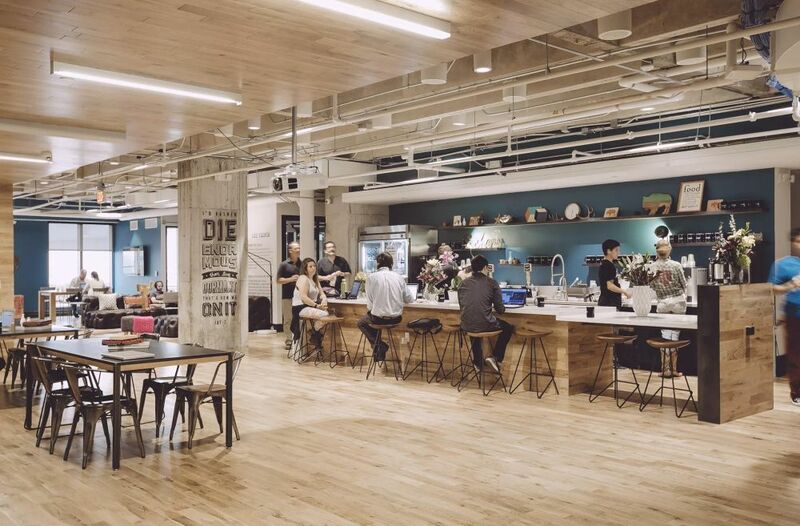 However, down in lil old Austin, they have four spaces and are about to open a fifth one downtown on 12th St. WeWork essentially started the coworking revolution and is the biggest one worth a staggering $45 Billion valuation as of October 2018. 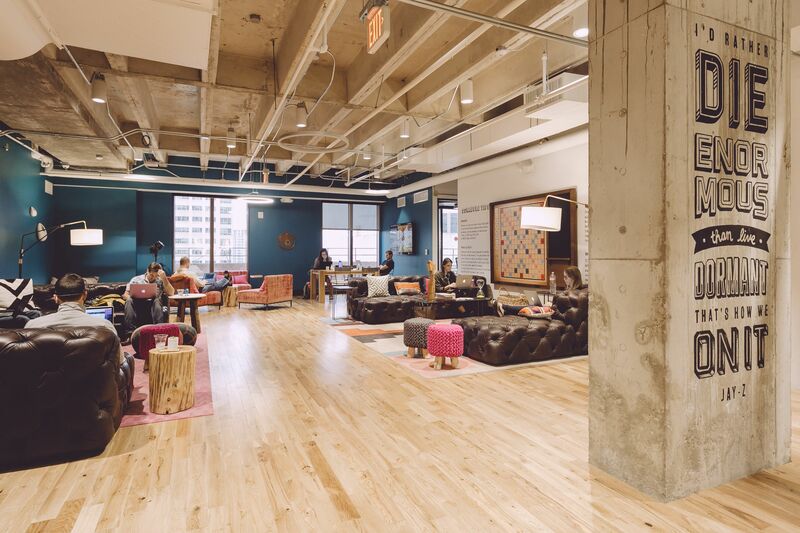 With a huge emphasis on community building and super sharp interiors, WeWork is a juggernaut that ain't slowing down anytime soon. We look forward to their sixth location, which is being built on E. 6th st just one block from the Austin Craft Realty world headquarters! 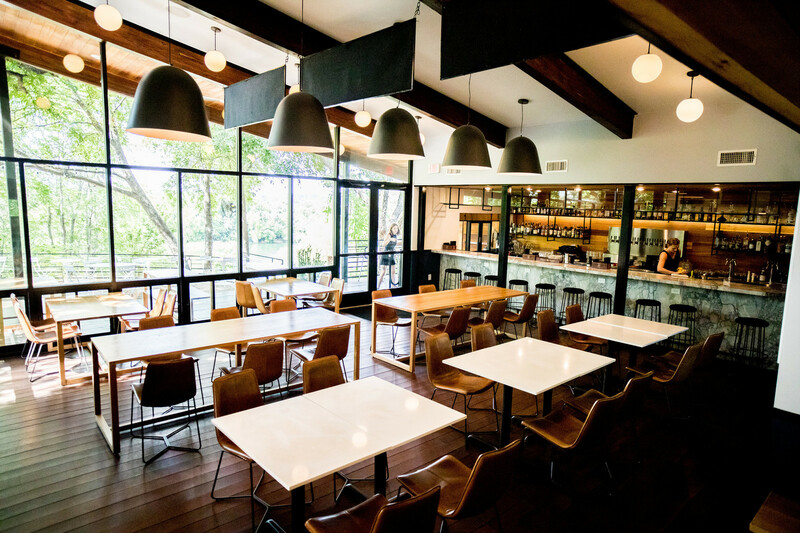 Check out the pricing for their space in the epicenter of Austin's downtown. We're seeing $390 for a "hotdesk" that is basically a guaranteed space somewhere, $500 for a dedicated desk, and private offices with glass walls start at $900 and quickly spiral upwards to the low 5-figures...but hey, if you've got that sweet sweet VC money and aspirations of rapid growth, why the heck not?! 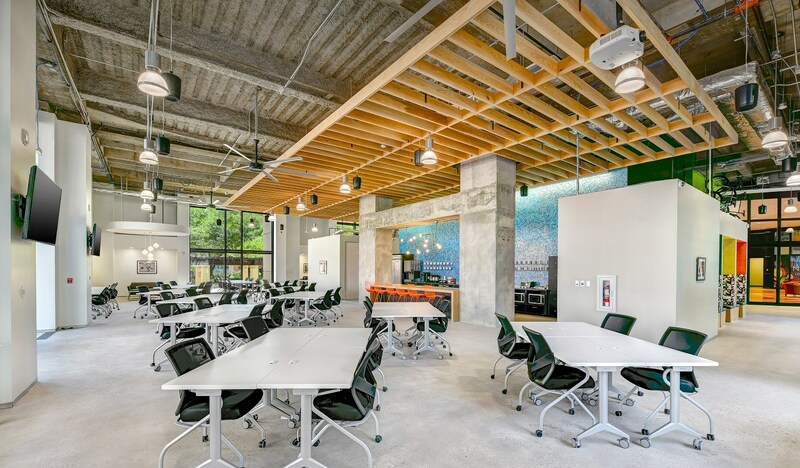 Galvanize is another exciting Austin coworking space that focuses on providing many tech-oriented education courses, from coding bootcamps to part-time data science classes. Their location in the NorthShore luxury apartment building off the bustling, walkable 2nd Street District puts you in the middle of the coolest, most thriving part of Downtown Austin. They are a little heavier on the career advancement resources, which would make them a very enticing option aside from their PRIME location at NorthShore. Industrious is a big new player in the game as of late. The NYC-based coworking company is already in over 60 locations in 34 US cities. Their Austin offering is located in a stunning new office tower at 5th & Colorado. Desk and private office prices are very similar to WeWork. Impact Hub encompasses two locations in Austin - N. Central and S. Central - and has a slant on working to act as an accelerator to help start-ups working towards social causes. Also known as VUKA and apart of the VUKA collective, Impact Hub has one of the coolest warehouse coworking spaces we've feasted our eyes upon down on Monroe St in 78704. It's dog-friendly, and even has that Fair Trade coffee that you so desperately need. 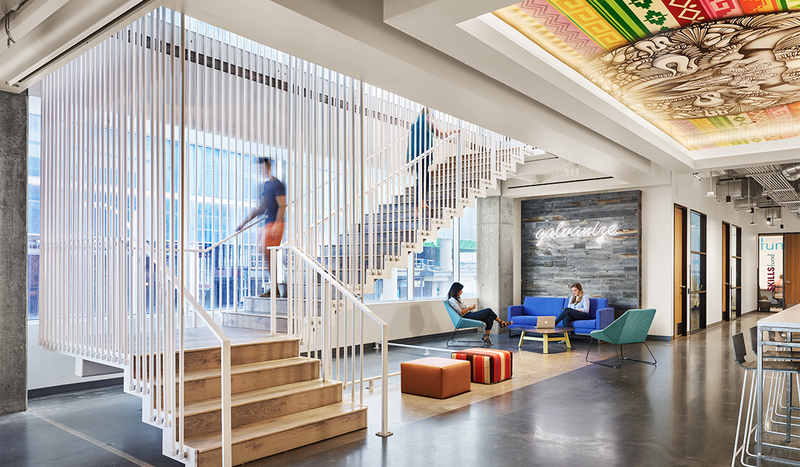 TechSpace is one more very popular Downtown Austin coworking space that is one of many of its kind in cities around the country. We really love its location at the Four Seasons office tower at C. Chavez and San Jacinto. Prices are consistent with the rest! Then there's Regus, which is a worldwide competitor that gives one many options but is less geared towards community building. Instead of featuring their own exclusive facilities, Regus allows you to sublet office space at a bevvy of flexible terms, from hotdesks to actual large private offices. They even offer a "virtual office" option, which according to their website helps you "Create a credible and professional business presence at a minimal cost, with a mailing address in a prime business location." This is probably the best option if you have a team of over 6 people that's looking to grow, as the private offices over that many people in these coworking spaces get very expensive very quickly. But what are some alternatives if you're not wanting to get thrown in to a massive coworking space, or are seeking to save money or are looking for a special niche? 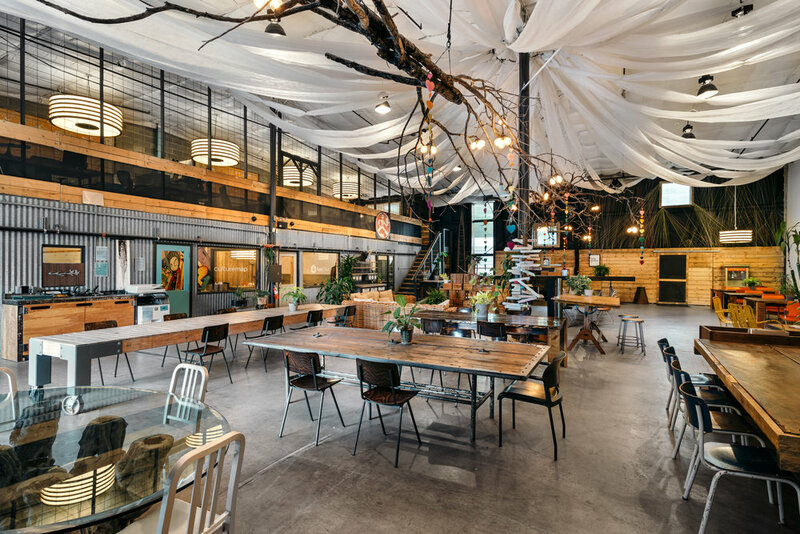 There are many smaller local coworking spaces, such as The Refinery (which is about to turn in to a female-only space), Swivel, Perch Coworking (ran by our friend Lisa just one block away! ), Atmosphere, Patchwork, Fibercove, and Meld, just to name a few. 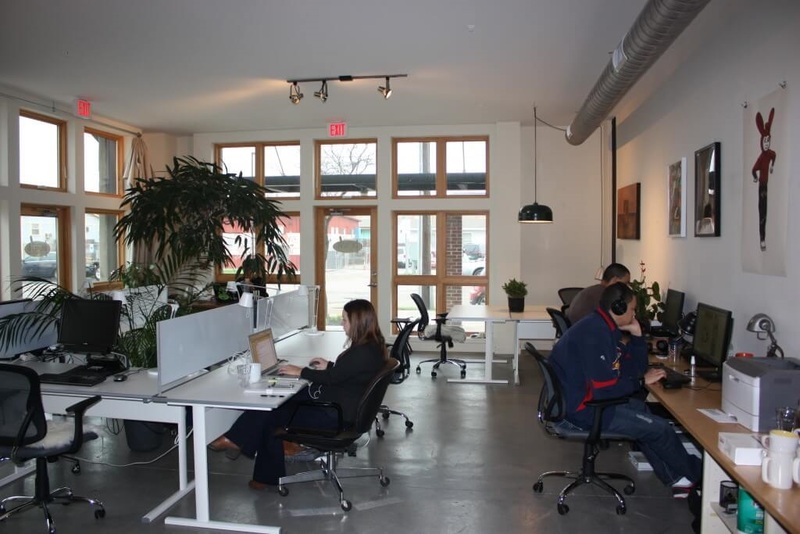 Inside the smaller, independent Perch Coworking off E. 6th St. There's also a great new concept called ReSET that is ran by two friends of Austin Craft Realty's that takes fancy dinner-only restaurants in different Austin locations and turns them in to coworking spaces for much less cost than the ~$350 minimum for a hotdesk that most of these coworking companies start at. You can even buy 10-pack passes, and ACR clients get them for $65 instead of $80! We love working with small Austin businesses looking to innovate in the coworking space, and dig the flexibility of ReSET. And finally, there's always the good 'ol idea of just setting up shop in your favorite local coffee shop! We see fine folks working out of our go-to shop in Lazarus Brewing Co on a daily basis, and technically all is costs them is a five dollar latte. But you don't get any of the great resources that coworking spaces offer, and then you have to deal with the afternoon beer drinking crowd or the annoying, disgruntled customers who aren't in work mode like you are! The coworking revolution is very much synonymous with the rise of the tech-empowered millennial workforce. Luckily, you have many options in front of you when considering where to set up shop here in Austin. Drew has been an Austin REALTOR® since moving here in 2010. Originally from Ft. Worth, Texas, Drew fell in love with the city of Austin as a kid when he was captivated by its eclectically progressive lifestyle and music scene. Drew spent four years at Trinity University earning his degree in Business Marketing, during which time he spent a semester abroad in Sevilla, Spain. With expertise ranging from urban apartment locating to sales and investments, Drew seized the opportunity to help current and future Austinites find their niche by forming a team of passionate agents and founding Austin Craft Realty. Drew himself has proven to be an effective Realtor due to his open and speedy communication, creative negotiation skills, and rare blend of youthful energy with eight years of experience. Drew believes the lasting relationships and friendships he has developed with clients is the most rewarding aspect of being in real estate in Austin. 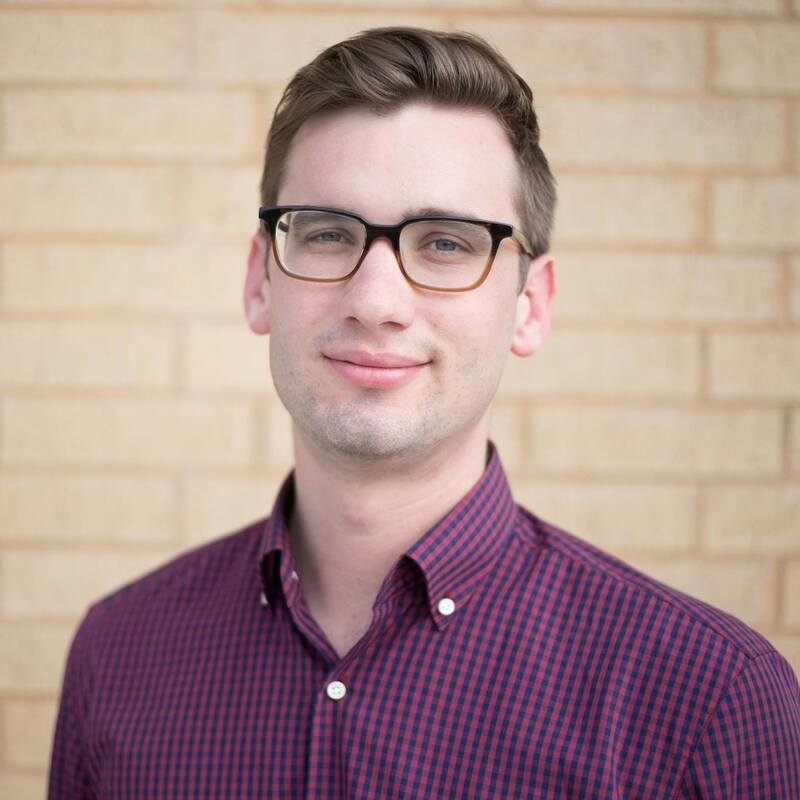 When Drew isn’t working with clients and running Austin Craft Realty’s office, you might find him bicycling around town, serving on the board of the Young Men’s Business League, playing saxophone at some of Austin's best venues, and enjoying the latest craft brews. Whether you need a good recommendation for live music, a new restaurant destination, or simply an excellent Realtor to help you navigate the Austin market, Drew is your man. Our friends at Granite Foundation Repair have written a great blog post to help us all understand the nature of foundation repairs. With some education and the right professionals on your side, this prickly issue can be overcome without killing the deal! The fine folks at Domio [twitter: @StayDomio] have partnered up with us to write a guest blog post about all the ways to get big design out of small spaces. Our favorite idea is #8! While we LOVE being real estate agents in Texas, we DON'T love the arduous process. From bureaucratic red tape to burning the midnight oil whilst studying for the big test, you need to know what you're getting yourself into so that you become a top-producing agent and NOT another statistic from an expired license after year 1. Please confirm your email address by following the link we sent you in order to get added to the list.